They look so cute, so pretty, so beautiful, so delicate, so elegant, so divine, so simple to make… but they’re actually quite difficult to prepare. It’s one of the most challenging recipes I’ve made so far. I’m not joking, I promise! They’re tiny but evil creatures, haha Being successful depends on many factors such as the right proportion of ingredients, the humidity, the meringue texture, the folding process (“macarronage”), the oven… even on your patience! It’s not my intention to scare you, although it might look otherwise. The thing is, that is unusual to get them right at the first attempt. But, as I said in my previous post, you don’t have to throw the towel ever ; ) Maybe you might have beginner’s luck, who knows?! Having said that, it’s important for you to stick to all the steps of the recipe and follow each tip. Macarons are really fragile and we must be quite methodical when making them. For those who don’t still know what a macaron is, it mainly consists of two small and round shells (a baked mixture of meringue, ground almond and icing sugar) with some filling at your choice. There are different kind of macarons, depending on the meringue they are made of, such as French or Italian Meringue. The recipe I’ll show you is based on the French one (the Italian one is even more tricky!!). Why is this equipment essential? Kitchen scale: As I previously said, we must be really methodic when preparing this recipe. It’s really important to measure each ingredient in grams to get a precise mixture. Proportions are key. Don’t add the ingredients roughly. Don’t use measuring cups either. 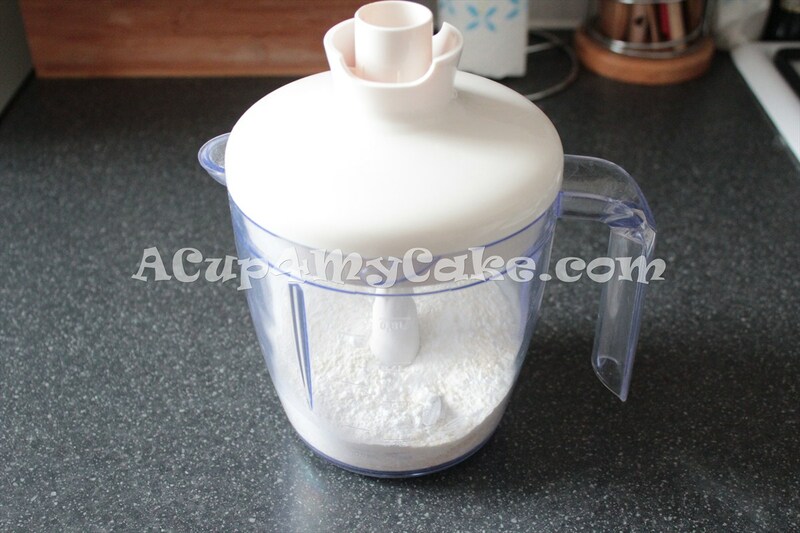 Food processor: It’s useful to blend ground almond in icing sugar and get an even and smooth batter. Sieve: It’s needed to sieve the blend of ground almond and icing sugar and get a smoother batter, free (or almost free) of bits. 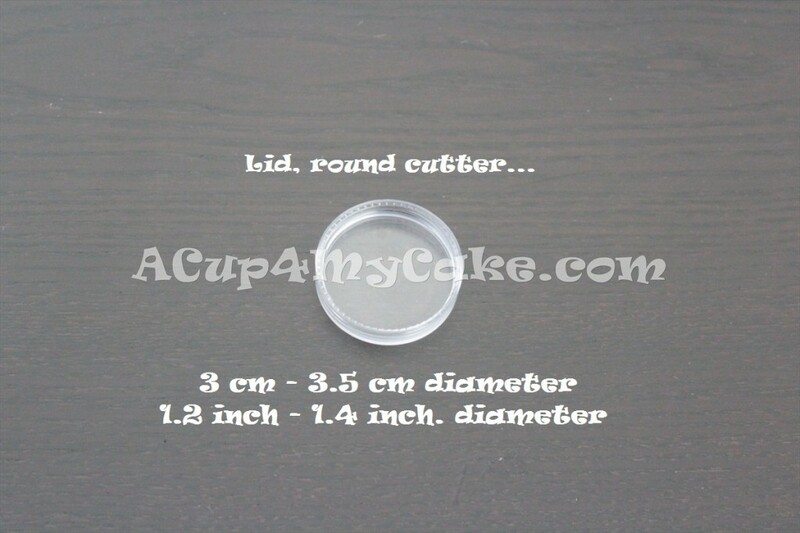 Therefore, we’ll have a smoother and even macaron surface. Whisk attachment: It’s essential to whip the egg whites by adding air into the batter and get a nice and thick French meringue. Mixing bowls: When whipping egg whites it’s better to use a cold stainless steel one. They’ll whip up better! All the tools we use to make meringue, including the mixing bowl in where we whisk the egg whites, have to be very clean, dry and grease-free. Otherwise, they won’t whip up properly. Clean the bowl by rubbing half a lemon if needed and dry with a kitchen towel. Silicone spatula: It’s used during the delicate folding process between wet and dry ingredients (also known as “macarronge”). 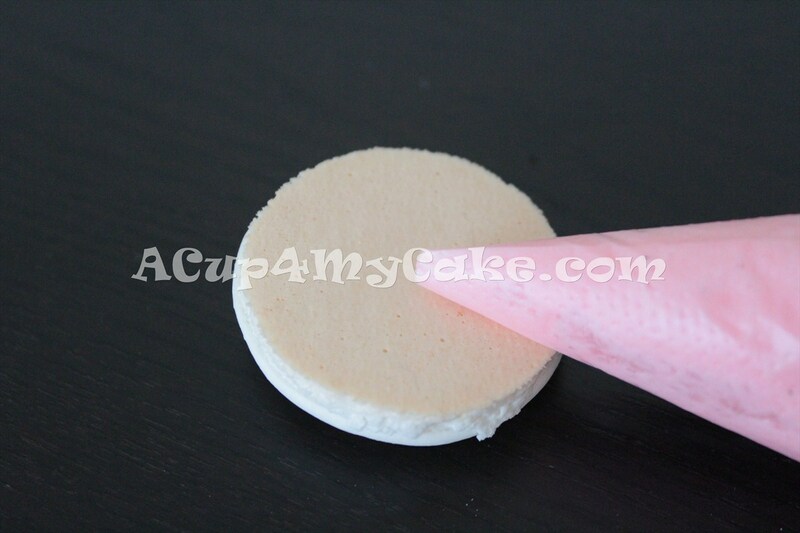 Piping bag + Round nozzle (#12): Macaron shells are formed by piping the batter in small circles. If you use a bigger nozzle, it’ll be more difficult for you to control the piping. Parchment paper or baking mat: They prevent the shells from sticking on the baking sheet. 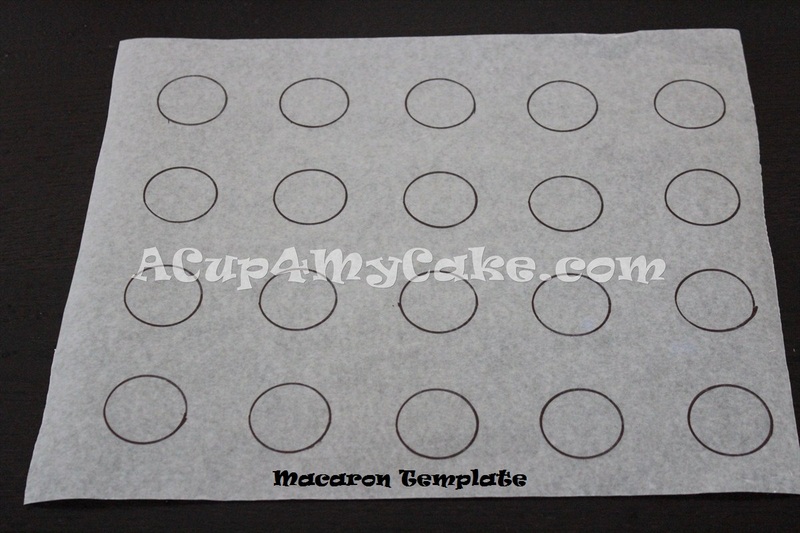 Macaron template (optional): Useful to make even shells, same size (around 3-3.5 cm /1.2-1.4 inches). I’ll show you how to make one by yourself at home in one of the next steps. Oven thermometer: Each oven is different and sometimes they bake at a wrong temperature, different from the one we set. It’s really important to bake the shells at the proper temperature to prevent the macaron shells from cracking or drying (too high temperature), undercooking (too low temperature), etc. • It’s better to use natural ones, although you can use both pasteurized and dried egg whites. • Separate them from yolk in advance and make sure there are no egg yolk traces. Otherwise, the egg whites won’t whip up properly. • Leave the egg whites to settle at least overnight (better 2-3 days, even up to 5 days), keeping them in an airtight container inside the fridge. The “older” the egg whites are, the better result, since they’ll have lost most of the humidity, and that’s what we’re looking for by using “aged” egg whites. • Always bring them to room temperature before using. Don’t use cold egg whites. • Each egg white weighs around 30 grs. ♥ What on Earth is cream of tartar? • This ingredient helps to stabilize the egg whites and hold their shape once they’re whipped. You can use a pinch of salt or 2 tsp of lemon instead for this purpose. ♥ About food colouring: If you decide to colour your macarons, you should use a bit of paste colouring, since liquid colouring can affect the consistency of the batter and ruin it. 1) Weigh the icing sugar and the ground almond precisely in your kitchen scale. 2) Blend them together with a food processor for around 1 – 2 minutes. This will help to get a smooth batter. 3) Sieve the previous blend twice. This will also help to get an even smoother batter. 4) Get rid of large bits to ensure a smooth batter. 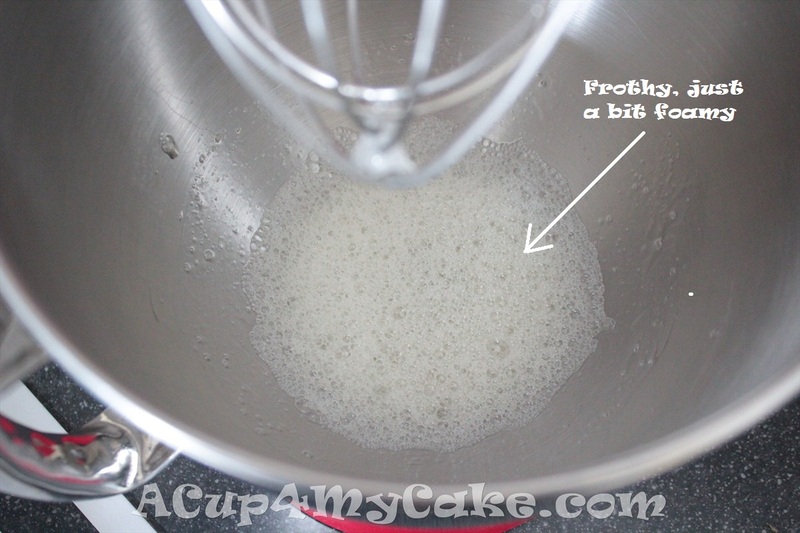 6) Mix the egg whites with the whisk attachment at medium speed until frothy (lots of air bubbles on the surface). 7) At this stage (frothy), without stopping your mixer, add the cream of tartar (or a pinch of salt instead). 8) Keep mixing at medium speed until you get a beautiful and light foam, with still some air bubbles. 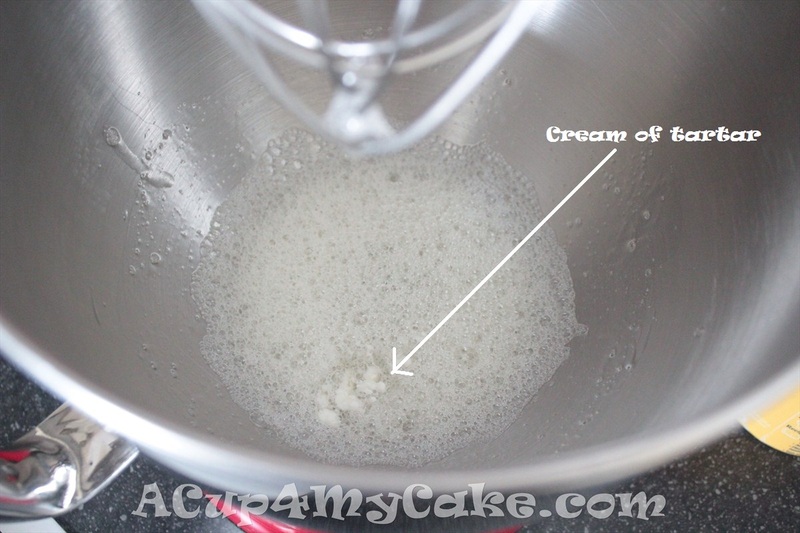 The whisk will leave noticeable tracks on the surface of the foam. 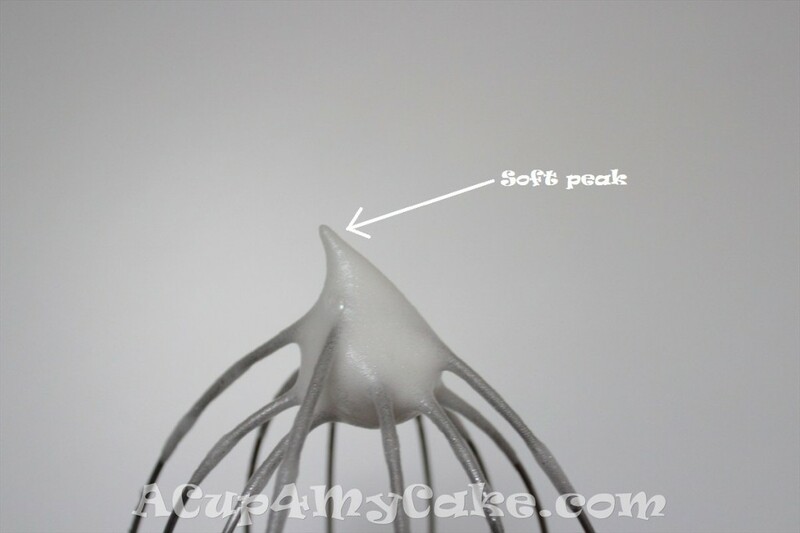 Soft peaks are formed when lifting the whisk from the batter. This consistency it’s not stiff enough, it won’t work. We should keep working the meringue. 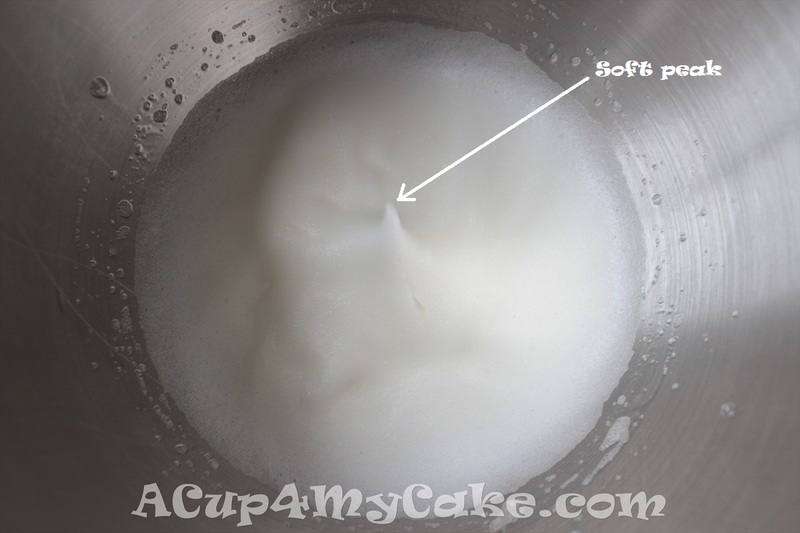 9) At this stage (nice foam, soft peaks), without stopping your mixer at any moment, turn your mixer to high speed (8 in KA) and gradually add the caster sugar in 3 additions, mixing well between each. 10) Keep mixing for a while at high speed (8 in KA) until you get a really creamy, even, glossy and thick meringue, with no longer visible air bubbles. This is the French meringue texture we’re looking for. The mixing time will depend on the room temperature, humidity, etc. Whatever the case may be, some more minutes of mixing before adding the caster sugar will be required. 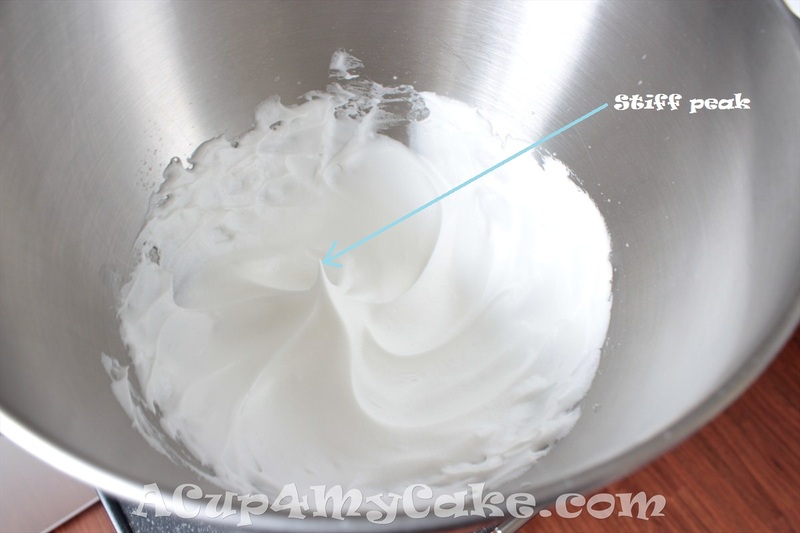 • Pay attention to your whisk: the meringue will clump inside it. 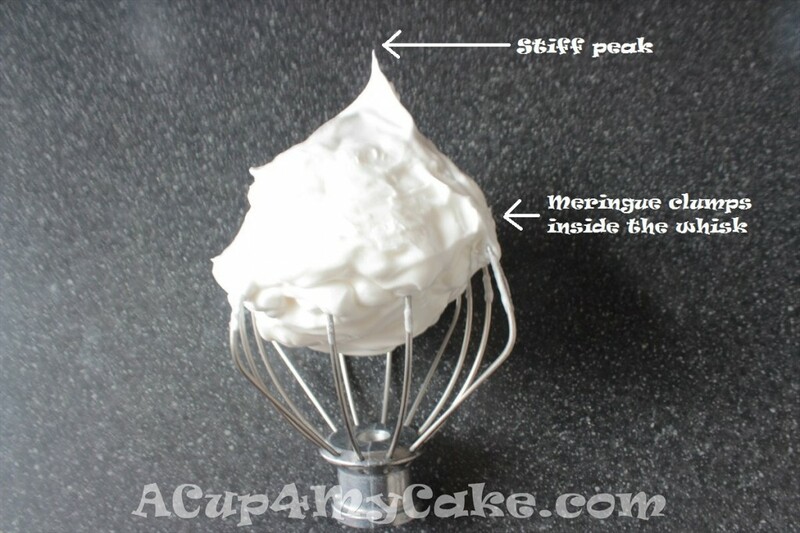 • Lift the whisk from the meringue: you’ll get stiff peaks, that is, peaks that hold their shape with upright tips. • Turn the bowl upside down: the meringue doesn’t slide off. It’ll remain in the bowl. When you get this texture, it’s important not to over-beat, as we can “break” the meringue! Note: If you want to add some food colouring, do it right when start getting stiff peaks and mix just until combine. 11) Gradually add the dry ingredients to your meringue in 3 additions. 12) Gently fold the mixture by means of a silicone spatula in order to get the right consistency (neither too stiff, nor too runny). Fold well between additions, around 50 folds in average (never mix!). You should get a smooth and glossy batter, with no visible dry ingredients (lava-like consistency). How to fold the mixture? Slide gently your spatula from bottom to top and from top to bottom, making circular movements. Repeat this until the mixture is evenly blended. • Lift the spatula with a portion of batter and let it fall: a large “thick ribbon” of batter will flow downwards smoothly (lava-like consistency). • Don’t overfold: otherwise, the mixture will be too runny and the piped shells won’t keep their shape, they’ll spread and they’ll come out completely flat and irregular from the oven, even feetless. • Don’t underfold: otherwise, you may have uneven cracked macarons or macarons with an important pocket of air inside. 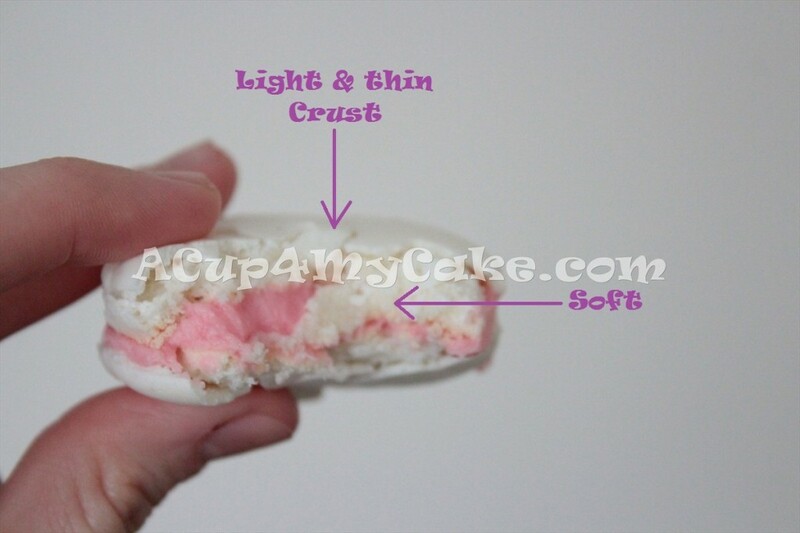 They also may look like a meringue cookie instead of a nice and flatter round shell. 13) Attach a plain nozzle (#12) to the piping bag and fill it with the macaron mixture by scooping carefully with a silicone spatula. Tighten the piping bag on top after filling it. 14) Line a baking sheet with parchment paper or place a baking mat on it. 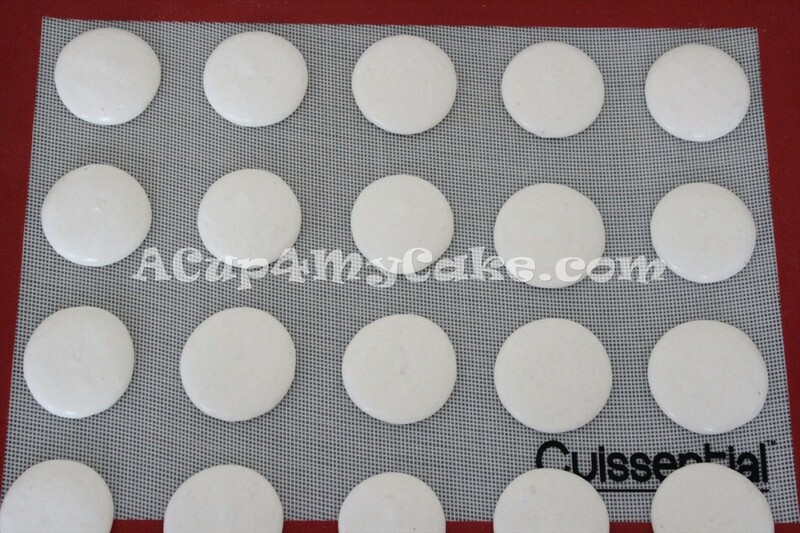 You can use a macaron template to make evenly sized macarons. 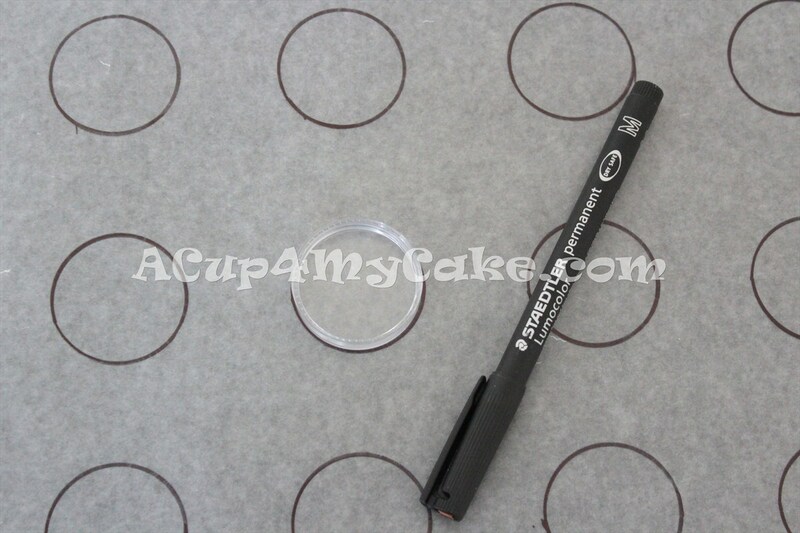 Make it by yourself at home by using wax paper, a 3 – 3.5 cm (1.2 – 1.4 inch) round cutter and a permanent marker. Don’t forget to leave a gap of 4-5 cm (1.6 – 2 inch) between each circle. Make sure the template fits on your baking sheet. It’ll be reusable. 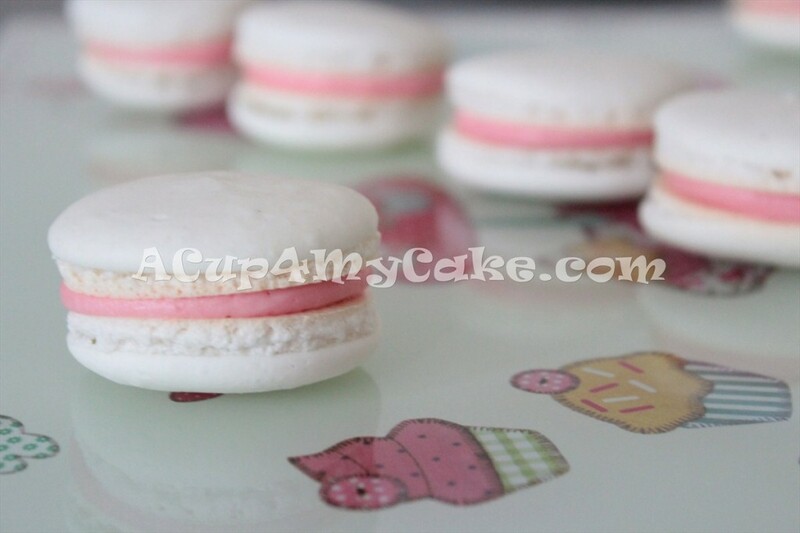 15) Pipe the shells onto the parchment paper or baking mat and remove the macaron template carefully. 16) Tap the bottom of the baking sheet against your worktop in order to remove any peaks and/or large air bubbles (do it twice if necessary). In addition, you can remove the most rebellious air bubbles by means of a toothpick and/or flatten the peaks with a small palette knife. You have to proceed quickly when doing this, before the batter starts drying, in order to prevent the macarons from marks. Despite this useful tip, if peaks keep after tapping the baking sheet, it’ll mean that the consistency of the batter is not right. 17) Leave the shells to dry for around 1 – 2 hours or until no longer tacky. The time will depend on the ambient humidity. After this, a thin layer will be formed on top. You’ll notice it by gently touching the macaron surface. You can’t skip this important step by any means, since we want the macarons to lose humidity and form the mentioned thin layer on top. This layer will help the macaron to form the well-known feet during the baking process, as the heat won’t be able to escape through the top and it’ll escape through the bottom. So don’t leaving them to dry before baking can produce both cracked and footless macarons. 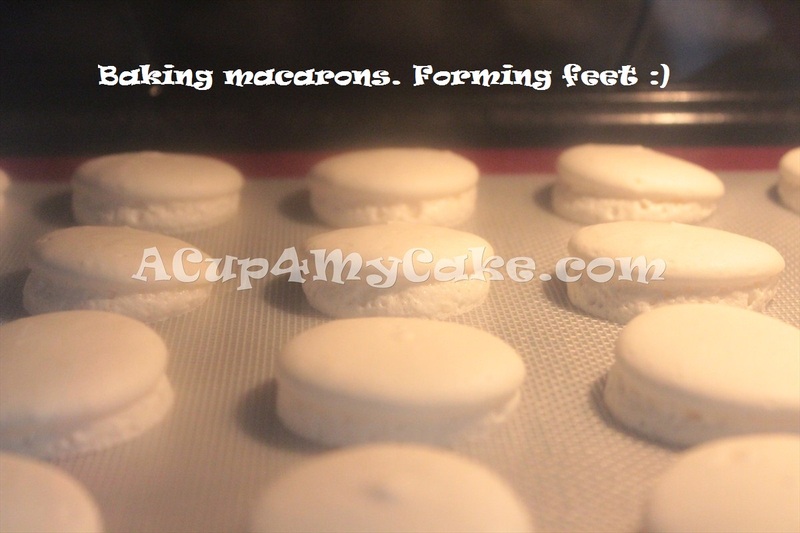 18) In a preheated oven at 150 º / 300 F (read an oven thermometer), bake the macarons for around 10-14 minutes. It’s difficult to set a steady baking time, since each oven is different and the temperature varies. • Tap a shell: it’ll sound hollow. 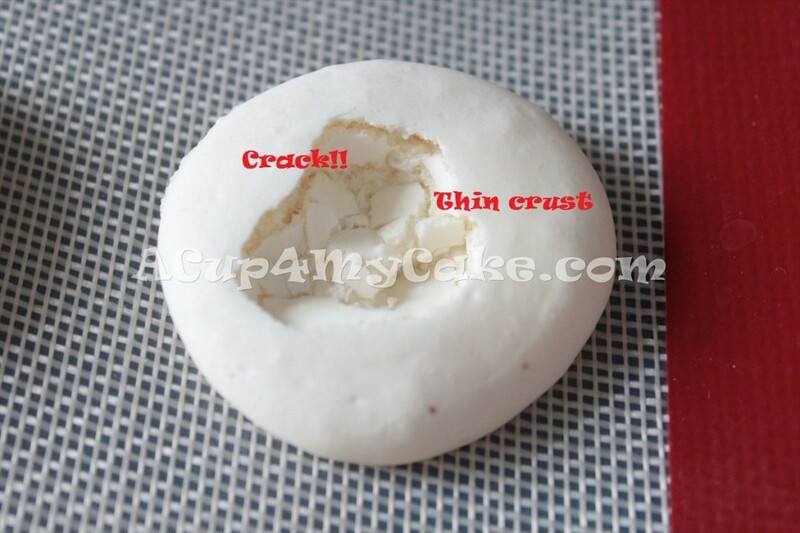 • Crack a shell with your finger: a thin crust should be broken. • Remove a shell with a small spatula: it’ll come off easily. Don’t let the macarons get brown on top, as we just want them to dry, not to cook. They have to keep the original colour. Rotate the baking sheet halfway through baking process to allow an even baking, if needed. • Oven temperature too high: cracked shells on top /Browned macarons. • Overbaking: dry and crunchy macarons, like meringue cookies. • Underbaking: macarons will separate when trying to lift them off the baking sheet / They’ll stick to the parchment paper after baking, breaking very easily / They can look hollow inside. 19) Let them cool for 5-10 minutes on the baking sheet. It’ll be easier to remove the shells from the parchment paper if you do it. After that, place them on a cooling rack and let them cool completely. 20) Once the macarons have cooled, you can fill them with chocolate ganache, buttercream, jam, toffee, peanut butter… Anything you fancy! 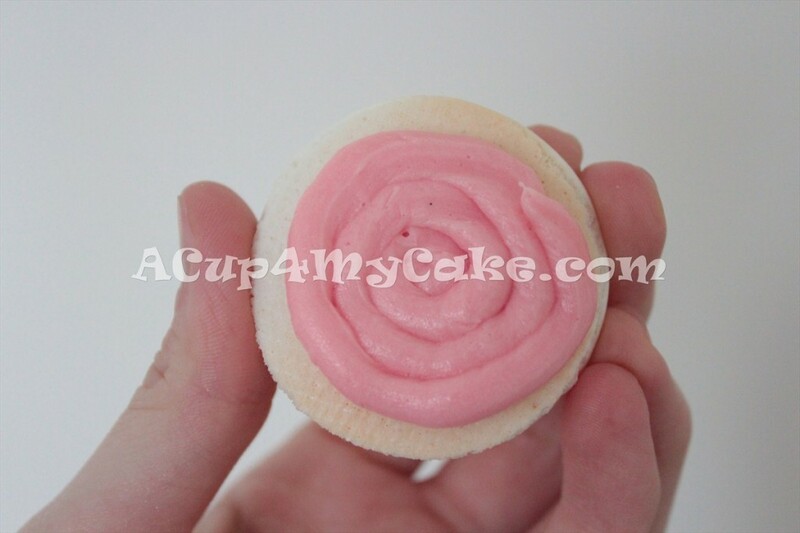 In that occasion, I used pink coloured vanilla buttercream My favourite! 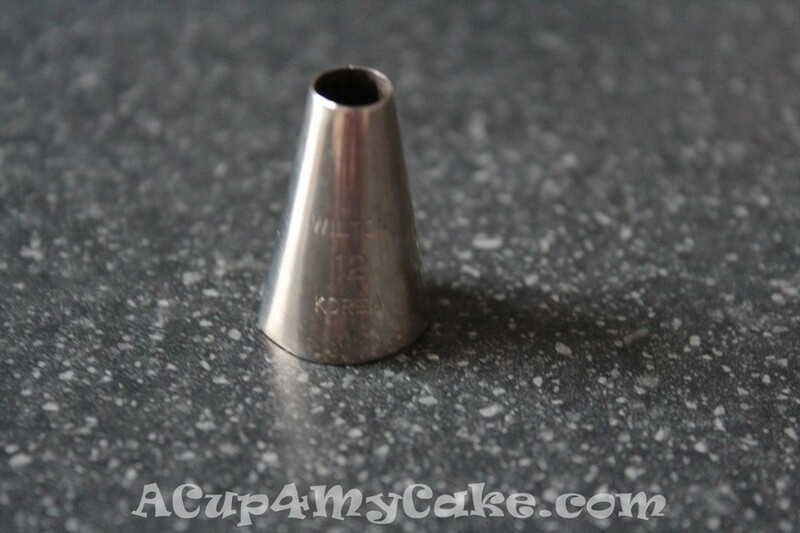 It’s easier to fill them by means of a piping bag, applying the filling just on the bottom of one shell. Be careful when handling the shells, since they’re really fragile and they can break easily. 21) Combine a couple of shells (one unfilled-one filled), press them gently to spread the filling, and you’ll have your macaron ready. 22) EAT THEM with no regrets! 24) Feel free to have seconds! • Unfilled macarons: can be stored in an airtight container for 3-5 days. • Filled macarons: keep them in an airtight container inside the fridge up to 2-3 days. Bring to room temperature before eating them. They are even tastier 1-2 days after having been made! I’m aware that I must practice and practice to get the perfect macaron. And I will! Once you feel confident with basic macarons, you’ll be able to apply your own twist (different colours, flavours, even different shapes…). P.S: don’t confuse macaron with macaroon. They’re not the same! This entry was posted in Gluten-Free, Macarons, Recipes, Tutorials. Just finished reading many of your posts and only want to say that your blog is amazing!! I`m baking every single day cookies, cakes, cupcakes or whatever I have craving for. They taste really nice but they look UGLY… nothing to do about that… Hope I can improve my technique with your tutorials!! xoxo from a Catalan living in Switzerland! Happy to hear from you!! So… are you mad about baking too? These are great news, Sarah! We’ll bake together when you come to London, for sure. Amazing, as always. You’re so talented!! I’ll translate this post to Spanish, consider it done! Thanks for sharing my post. You’ve been really helpful! For those English people who read this comment and don’t know Alma yet, check Alma’s blog: http://www.objetivocupcake.com/. It’s impressive! Hola guapa ya que eres española, a ver si pones este paso a paso tan estupendo en castellano. Un saludo. Gracias por dejar tu comentario. Aún tengo poquitos en mi blog, pero cada uno de ellos me hace muy feliz. Muchas gracias! Yo soy de las que espero el paso a paso en castellano, aunque se entiende perfectamente en inglés, nada como la lengua materna Bss. En breve lo postearé en castellano : ) ¡Espero que os resulte útil y os ayude a resolver algunas dudas macaroniles! ¡Gracias a ti por dejar tu comentario! Entre hoy y el jueves publicaré el mismo tutorial de macarons en castellano, por si prefieres esperar un pelín ; ) Son pequeñines, pero de sabor tan intenso y textura tan espectacular que vale la pena aprender a hacerlos. How do you prevent browning on the top? Your macarons are gorgeous! You have to bake them at low temperature (150 º / 300 F) (better if you use an oven thermometer to read the temperature accurately) and try not to overbake them (just around 10-14 min). When the food starts forming, you should pay attention all the time in order to prevent the top of your macarons from browning. If you don’t, just a bit of extra time will be enough to brown them! Hello! Your macarons looks so delicious! I have tried baking it today according to the steps which you have listed. However, I have already leave the macarons to dry for 3 hours but there isn’t any difference compared from the start. Is there anything which I have missed out? After drying, you have to gently touch them and check if they are no longer tacky. If there is so much humidity, it’ll take them longer to dry. What was exactly the problem? I don’t know what is the problem but the first time I did it was a success but the second n thrid time I did it couldn’t dry and the cookies turn out to have no feet and the shells are my smooth. Is it because I did not use the scale for the second n thrid time??? How do you prevent air pockets from happening? Every time I make macarons I find air pockets in my shells. Once the macarons piped, prick the air bubbles with a toothpick. After that, tap the bottom of the baking sheet against your worktop several times in order to remove any remaining air bubbles. Then, leave the shells to dry and proceed as usual. i’ve made tons of macarons and none of them came out right. some of the batter wont dry and when they do, they have a soft-ish layer of skin that feels oily. macarons are killing me! Wow!! Your macarons look amazing ! I have had two attempts at making these delicious cookies but just can’t get it right I am desperate to master these tricky little treats as they are my daughters favourite and I’d like to make them for her birthday . How do you get them so perfectly round and smooth ? I’ve tried using a template but they still don’t look great they also have little peaks on the top. Macarons will be smoother if you blend together the ground almond and the icing sugar by means of a food processor and then you sift them several times. They can be perfectly round if you use a template, you pipe them with the nozzle completely vertically and the consistency after the macarronage is right. If it’s too runny, they’ll spread. If it’s too stiff, you’ll notice peaks, lumps… Several attempts are usually needed until finding the proper consistency, so don’t worry. If the consistency is right, peaks will disappear in some seconds once the macarons piped. If there are persistent peaks and the mixture is not too stiff, they can disappear when tapping the baking sheet against the worktop. As a last resort, you can smooth peaks carefully with a small and dry spatula. Baking paper is non-stick by itself (there’s no need to brush or spread anything), so macarons shouldn’t be sticking to it. Leave your macarons to cool completely before removing from it (important step!!). Otherwise, most probably they’ll stick. Where your macarons baked enough? If they were raw, that might have been the problem. 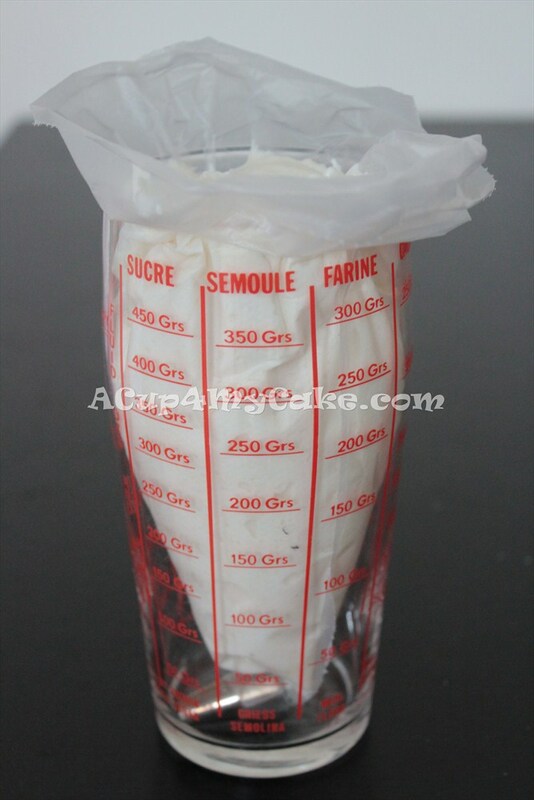 100 grs Icing sugar, I don’t want my macaroons to be too sweet, does it matter if I do 100 grs ground almong and 50 grs icing suger? Will the macaroon still looks beautiful like yours if done correctly? Thank you. Don’t over fold to prevent the macaron from spreading when piping (it’ll be too runny). Instead of baking with a regular oven, can i use a toaster oven? I use a regular oven, but you can try with a toaster one. Let me know if it works! I always remove the template after piping the macarons in order to reuse it, but you can also bake the macarons on the template, as it’s made of baking paper (non-stick). Just one thing: make sure the permanent marker circles are on the opposite side (facing the baking sheet, not the macarons). First time I baked macarons, I made a template by using a pencil and I kept it whilst baking, but once the macarons came out from the oven, they had a pencil circle printed on their base! lol. You macarons look beautiful! I just had an attempt and the feet burst and spread in the oven i think it was due to the oven being too hot – does that sound about right? My oven is old and a bit rubbish! I also kept them in a bit long as they browned but were only in 10 mins – again i’m thinking it was the temperature? Advice would be appreciated. Mine taste lovely, but look hideous!! It makes sense. If you’re oven is so old, it may be not working at the proper temperature. Macarons usually burst and brown when the oven is very hot, so try to reduce the temperature to 140º when baking them. Macarons can also spread and burst inside the oven when they’re not dry enough, but I think that in your case, considering the information that you provided, the problem must be your oven. I have tried a few recipes, every time I add a colour they never bake anything like the colour they went in the oven. Maybe you’re baking them longer than they need to (or at a higher temperature), therefore they get golden brown, which may affect their original colour. Try to reduce the baking time (or the oven temperature) to prevent them from browning and to keep their colour better. U have a fantastic website and gorgeous macaroons. I wonder if you could give me some advice. My problem is that my macaroons come out of the oven with a bump on the top-it looks like it has a big air bubble that has expanded while cooking. I do rap the baking sheet on the counter after piping and also burst any that I can see with a toothpick but this still happens. Do u have any tips for this problem. Sometimes we add too much air to our batter during the macarronage if we fold incorrectly. We have to make circular motions, from top to bottom (never mix!). I have a question: are they hollow inside? My macaroons always seem to be hollow and not have that chewy merange taste to them. Any advice welcome!? Sometimes macarons are hollow inside because the batter has been undermixed during the macarronage or they haven’t been baked enough. Your macarons look amazing. I have been scratching head as to how to tackle the humidity issue. I have made macarons couple of times back in Australia and never failed once. But things are different here in Vietnam when humidity is so high. I have tried different drying methods but none gave me success. Air drying seems impossible, i.e i left the macaronage for a day to dry and they were still sticky to the touch, plus the shells didn’t look smooth anymore. Oven drying for an hour at 50 degree celcius did produce some better results, but the shells weren’t smooth either. The thing is when i oven dry, those shells do form a thin skin but once i turn up the heat, the skin kinda “melt” away. Have you had the same issue? Or an idea what might be the cause? This is really frustrating and I would muchly appreciate any suggestion. I’ve never had this issue, but some batches took them so long to dry (even hours). I never bake them until they’re firm to touch, that is, until a thin but firm layer has formed on top. You should try to make them in the less humid days. I don’t personally know another drying method. I just wait and wait for them to dry at room temperature. I just made macroon today n its my 2nd attemp and turned out pretty but I find tht your are still beuatiful . 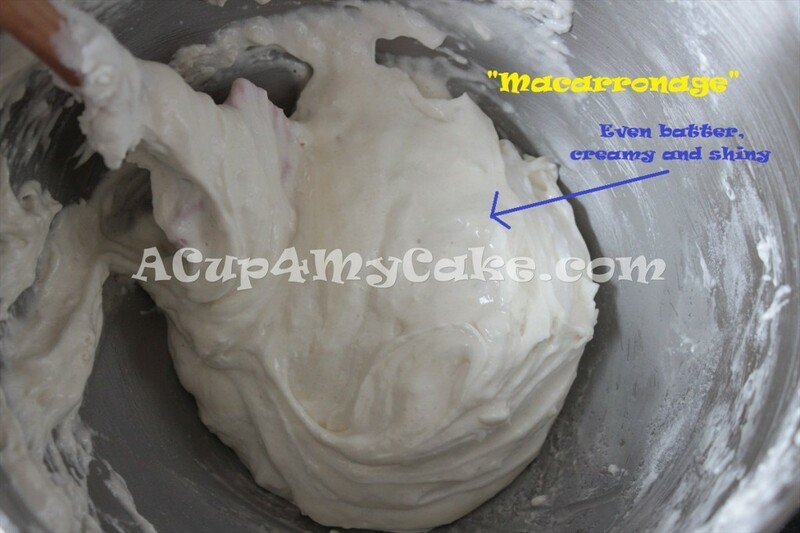 Thank you for the sharing the step by step on baking macroon ! That ‘s very generous of you to share your expertise . Thank you so much for your nice comment, Shaleha! My mixture looks very granular after I’ve folded in dry ingredients and worried I will overdo folding if I carry on- what’s going wrong? How do I know or test when they are ready to remove from oven? Does opening oven to yeshiva affect the outcome as when cooking pavlova meringue? Please help I’m desperate to master these tricky little treats! Do you blend together the icing sugar and the ground almond in a food processor for 1-2 minutes? Do you sieve this mixture after that? 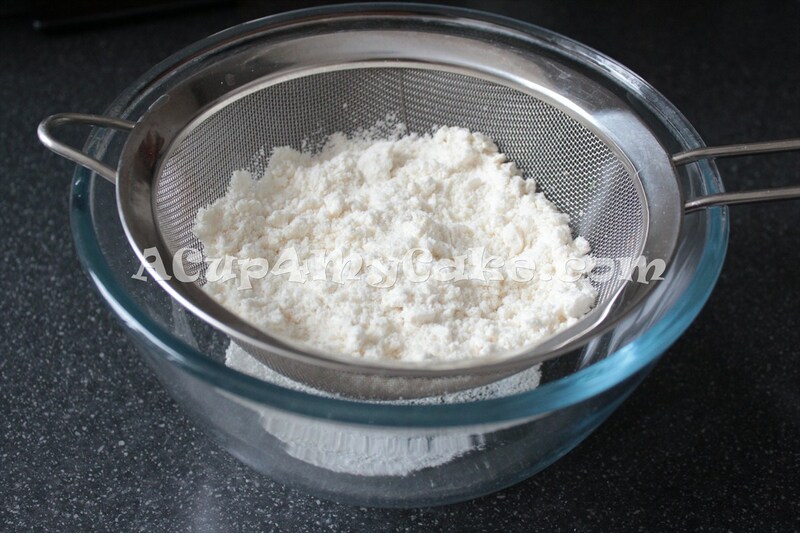 Sieve it 3-4 times if necessary to get a smoother mixture and avoid the macarons to look granular. There’s a part in the tutorial where I explain how to check if they’re ready to remove from oven. It’s better not to open the oven before the first 8-10 minutes. After a disasterous weekend of trying to master these I finally came across your blog and it’s helped me so much more than any professional recipes or videos so thank you so much!! I’ve now finally mastered the colouring issues and I’ve got my piping mixture texture correct but when they go in the oven I get a hit or miss outcome! Half are ‘perfect’ (or at least presentable!) but the other half crack on the sides and done have a bottom- they’re just completely empty in the middle- I just don’t understand how they can turn out so differently on the same baking tray and from the same mix- it’s not even as thought it’s the ones at the back or front of the oven- they’re totally random! Do you have any ideas or tips at all so I can get a more consistent bake? I’ve stupidly agreed to do 300 of them for a friends wedding favours so I’m open to any all suggestions! Wow Emma!! 300 macarons are a big challenge!! Macarons are very fussy, so it’s normal having troubles every now and again, specially at the beginning. It sounds like the temperature of your oven isn’t even. Try to reduce the temperature (there are people who bake them at 140 º C) and increase the baking time accordingly, as well as rotating the baking sheet halfway through baking. Sometimes we have to experiment with our oven in order to get used to it when doing new (and tricky) recipes! Good luck with your friend’s wedding macarons. can i bake the macaron with a toaster oven?? If you use a toaster oven, how long must you bake it? Hi Charis, I’ve never used a toaster oven, so I’m not sure. But it should be the same temperature. Thanks. My macarons can out looking like meringues. They didn’t have a foot, were air filled and had peaks. I am thinking I underfolded? 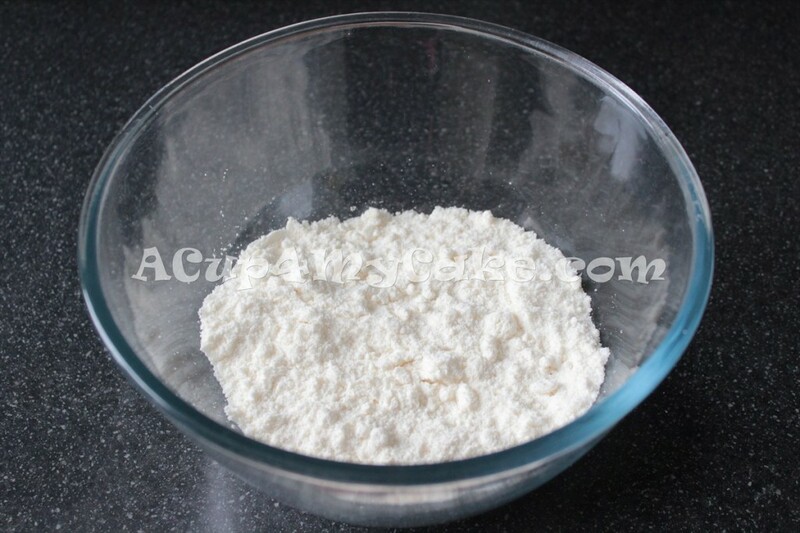 Try to fold the mixture very carefully, without adding too much air during the process. But do not underfold, as peaks will appear on top and most likely you will get feet-less macarons. Fold until the mixture flows like a smooth and large ribbon. Hi! Im really envious that Your macarons seem perfect!! Ive made them a couple of times following the recipe tediously and each had different results. The first batch i made, the top of the shells were hollow and lumpy. The second batch, didnt form a hard shell and they spread out upon piping . Third batch i thought was already okay until i tried to remove them from the parchment paper– theyre stuck and there was a huge space between the top and feet please help me perfect it! Thanks so much! More power to you! To avoid hollow macarons (or with a huge space inside) you can try not adding too much air during the macarronage, just fold the mixture carefully with a silicone spatula until getting the correct consistency. It’s also important that you make sure they are not underbaked. When the macarons spread out too much whilst piping, it means that you have overfolded the mixture and it’s too smooth and runny. When the macarons stick on the parchment paper after baked and cooled, it usually means that they’re underbaked. I love your macarons! They look beautiful. I have trouble with the color of mine. It seems that they always pick up the yellow tone from the almond flour and then the color is just off. Yours look perfectly white (plus color). Don’t over bake your macarons to prevent them to get a yellow tone. They have to keep their original colour. Can you please also tell the measurements for making 40 macarons in total too thankyou !! Normally you need to wait at least 30 minutes, although I prefer to wait between 1 and 2 hours to make sure they dry properly. They are dry when they form a thin layer on top (you can check this by carefully touching them with your finger). 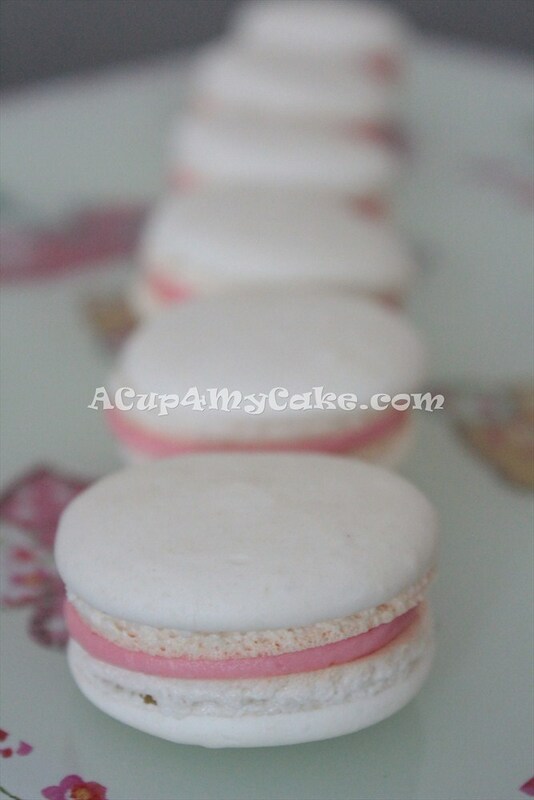 This layer prevent the macaron from cracking during the baking and helps to form the feet. As soon as you notice this layer, you can bake them. Can you also say how much cocoa we might need and thankyou very much!! Just add a bit of cocoa powder on a plate to dip the round cutter. A small amount will be enough. You can also dip a round cutter in icing sugar (powdered sugar) and tap it lightly on the baking mat. Makes perfect circles without having to pull anything out from underneath. Might be harder to see on parchment paper but that’s my advice for a baking mat. ….just about to put mine in the oven! Here’s hoping the come out as pretty as yours! Great tutorial! Thanks for sharing! Brilliant idea!! I’ll try it, definitely! When making chocolate macarons,maybe we can use cocoa powder instead to make the circles. I’ve tried these a few times now and I’m not sure what I’m doing wrong, when I take them out of the oven they’re hard on top and I leave them on the silicone sheet until they are dry and when I try to take them off the top part breaks off the bottom and the bottom just sticks to the sheet so idk what to fix about what I’m doing or not doing. Are you using non-stick baking paper? Are you setting the correct temperature in the oven? Do you think your oven is working at the proper temperature? 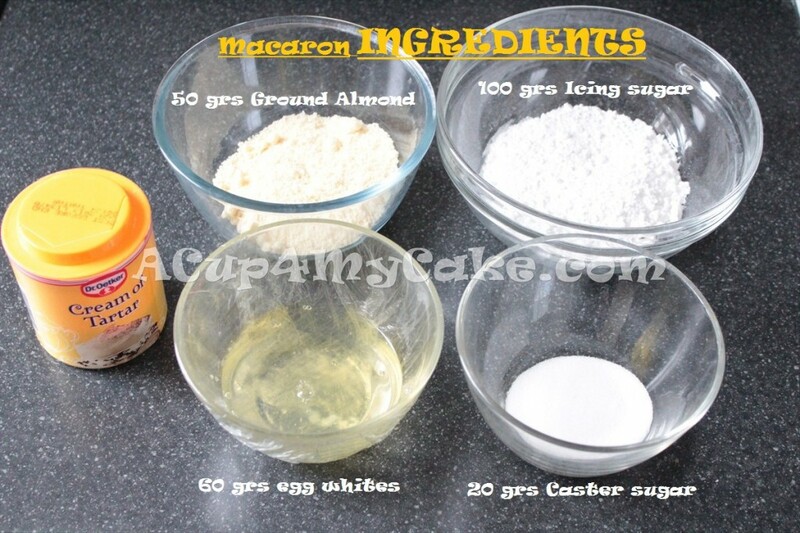 Hi Chets, thanks for sharing such useful guide for baking macarons! (: I tried but I dont know why my macaron shells do not have a “thin crust”, with uneven feet and they even stick to the baking paper. Were they baked enough? If they didn’t, it’s normal that they didn’t have a thin crust and they stuck to the parchment paper, definitely. The baking paper must be non-stick (read this information in the box). Otherwise, the macarons will stick despite having been properly baked. The oven is one of the most important factors to get perfect macarons. If the real temperature is wrong (despite you set it properly), if the heating is uneven… we’re going to have some trouble with our macarons. Currently I have an oven fan , which is brilliant to make macarons, as the air runs evenly throughout the oven. My macarons are looking better than ever!! I have tried to bake macarons many times. The few first times they turned out just fine. But now no matter what i try i dont get the feet. My macarons get cracked on top. They just get a little fat , and thats it . No feet.. My macaron mix does not look smooth as yours. (I have sifted ). I have rested my macarons for 2 hrs. I really dont know what i am doing wrong. When the macarons come out without feet and cracked on top, it can be due to a lack of drying time. Let them dry before baking as long as you need (more than 2 hours if needed, it’ll depend on the humidity), until they’re no longer sticky. They have to form a thin and dry layer. Sometimes, when the macarons are piped so close, the oven heat doesn’t have enough space to escape through the bottom of the macaron (which forms the feet). Then the heat escapes trough the top, cracking the macaron. Macarons can also be cracked by a high oven temperature. Reduce the temperature if necessary. Do you blend together the ground almond and the icing sugar in a food processor before sifting? 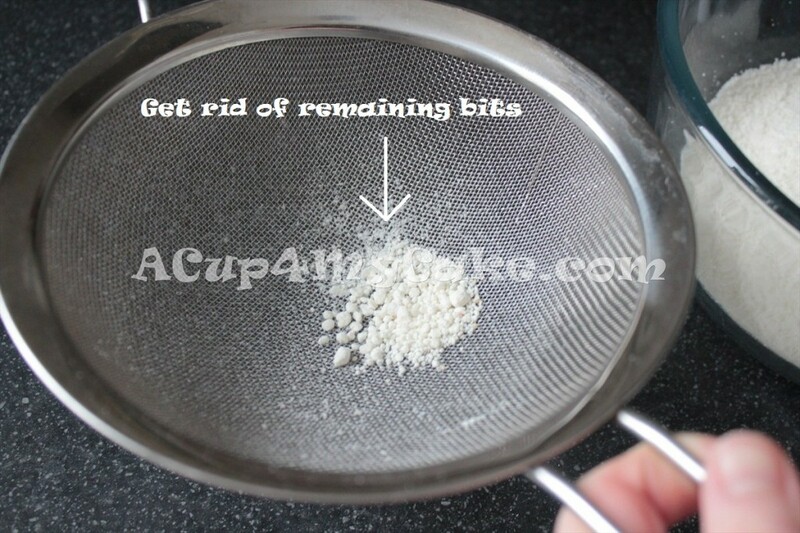 Don’t forget to to do that, and sift as many times as you need to get a smooth mixture. How does an overbeaten meringue look and feel like? I was guessing that my meringue was overbeaten as I had a hard time to macaronage! The macaronage just wouldnt become lava-like, its so stiff even after 1hour of folding! Its very exaggerated but sigh. Then when I tried again without having too stiff peaks for meringue, the results is the same. The macaronage just wouldn’t become lava-like. It’s my first time that I encountered such a problem. Then I thought if it could be that I used a superfine almond powder? Because the terrible failure comes after I substituted my almond powder, but is that really the factor? 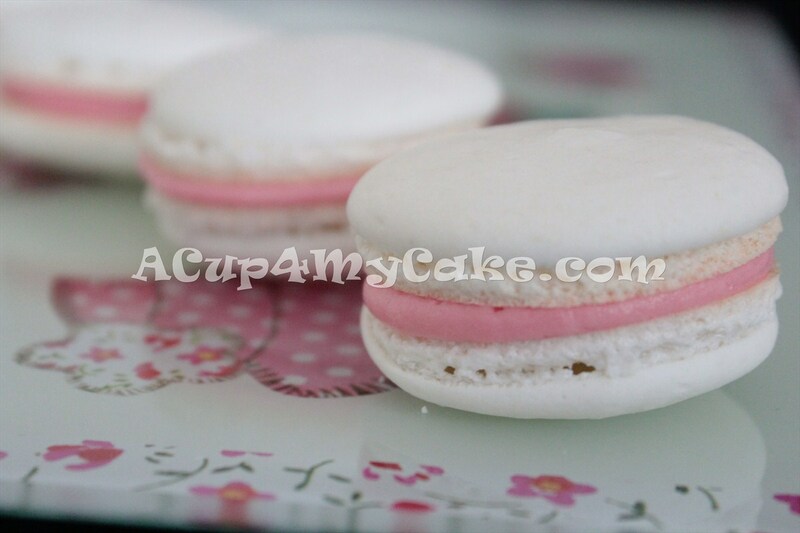 I sincerely hope you could help me out, I really want to make a perfect macaron. Thank you for your time and have a great week ahead! Sorry to hear that! An overbeaten meringue looks though, dull and dry instead of creamy and shiny (as it should be). A lot of air has been lost. As soon as you think that you’re meringue is ready, stop beating and turn the bowl upside down: the meringue shouldn’t slide off. It has to remain in the bowl. If it doesn’t, keep beating until so. I don’t think that’s a matter of the superfine almond powder, since the finer the almond, the more even and smoother the mixture. Have you weighted all the ingredients properly? What do you use to beat your egg whites? What speed? I’ll tell you what I’d try (it’s just my personal opinion): when your meringue is ready, start adding gradually the dry ingredients, folding carefully. When you find you get the correct consistency (lava-like), don’t add more. As I said, it’s just an experiment that I would do to try to fix the problem. Never give up! Keep trying until getting the perfect macaron, that’s a big satisfaction!! Your recipe for macarons turned out exceptionally well and I have made it a few times at a slightly lower temperature. I would like to make chocolate macarons so how much cocoa could I add and do I have to make any other adjustment to the recipe. You just have to add 2 heaped tablespoons of cocoa powder to your main mixture of icing sugar and ground almond and sieve all together. I’ve tried baking macarons a couple of times, and it has all gone smoothly until the oven part. It seems like it doesn’t matter how long I have them in the oven, they still come out underbaked and they are almost impossible to remove, even after I’ve let them cool off. Last time I had my macarons in for almost 20 minutes at 140 degrees and it was a disaster! I wanted to keep them in the oven until I could lift them off the baking sheet, but that just resulted in brown meringue cookies. It seems like there is just no in between, either it’s underbaked or overbaked macarons! I’m going to buy an oven thermometer just like you suggested, but do you have any other advice maybe on what time and temperature to try or something else that I should keep in mind? Thanks! It definitely sounds like if your oven is not working at the correct temperature. Try with an oven thermometer. Well I was sent over here to your blog as a referral and I have read everything. I paid very close attention to the comments section also. I am bound and determined to make these if it kills me. I don’t care if I have to make them a gazillion times. I am so determined. Thanks for sharing such a fantastic tutorial. I believe that you have covered every problem and answered it too. I will definitely let you know how mine come out. I have never eaten one but from what I hear they are quite delicious. I am in love with French pastries. I make canneles de bordeaux a lot and love them but always wanted to try the macarons. Wish me luck, I will share my results with you! I’m feeling so glad after reading your comment! Thanks a lot for taking your time in writing and transmitting such a big dose of positivity. Sure, let me know your experience! Hi, thank you very much for this tutorial and would like to share my experience. I could make wonderful macarons in my second try, yeaaah. First time had air pockets in the sells, but I could figured it out was the problem. Every oven is different of each other. My oven is conventional and has the heat in the bottom, so I put my rack in the second shelf counting from the top with a temperature of 325 F. I waited for 30 minutes so all the walls are warm enough to have an even baking. Put the shell for approx 12 minutes and in the meantime was praying the Rosary. I could not believe how good they were, I had just 2 cracked of 18, so it was not too bad. I think sometimes we are too concern about the batter, when temperature is a big thing. If you batter is a little too runny, do not skip the drying period of the shells, they will be fine when you touche them and form a little dent. So next time try some shells playing around the shelf of your oven with different temperatures until you can get the right ones. Thank you for sharing your experience with all of us! Happy to hear you can get wonderful macarons. Awesome recipe! I had a few trial and errors in the beginning, but after a few batches it came out perfect! Friends and family loves my macarons! I’ve been making all different flavors since i got your recipe down and it was all a success! I’m making a really big batch for my Niece’s first birthday in the Philippines, and I was wondering what is the best way to store the unfilled shells before their 12 hours flight to the Philippines? I’m going to keep them unfilled, and my brother is going to fill them there. You can store the unfilled shells inside an airtight container before the flight. Hi I have a question, I’m having such a hard time using a silpat (silicon mat) I can cook macarons on parchment and they’ll be cooked in 20 mins, and remove perfect. But if I cook them on the silicon mat for the same time its very hard to remove, they’ll stay stuck. Can you give me some advice please. Thanks. Would it be possible that your silpat has become sticky due to a frequent use and cleanse? I have two of them and the oldest one is now more sticky than it used to be. Anyway, it’s fine to use parchment paper instead if it works better for you. I have been trying to make macarons forever! And I just can’t seem to get them right! Every time I make them, everything seems good until I put them in the oven, after I do, the feet seem to explode and then the macaron spreads out. Is there any advice you can give for this to be avoided? I haven’t tried your recipe yet, but it will be the next one I try! Do you let them dry enough time before baking? If the shells are still wet and sticky, they’ll be likely to explode and crack. You should notice a thin layer on your macarons (touch with a finger) to ensure they’re dry enough before baking. Another reason to explain that, could be a high oven temperature. Try to reduce it or use an oven thermometer to make sure you’re baking at the right temperature. It happens! Good luck Elvina!! You have to let your macarons dry as long as they need (even more than 2 hours, depending on the humidity). As soon as they form a dry coat (no longer sticky), bake them, don’t wait much longer. Lopsided macarons can be caused by a runny mixture. Underbaking in one of the most important causes of hollow macarons. I know everyone is going to laugh or Judge me for this question for sounding stupid. But before you do, remember I grew up in America where for some reason on earth we do not use the metric system. We should but we don’t. So with that in mind do you know the conversion of 20 grams of castor sugar in to cups? I am having a really hard time find a conversion chart that does not go below 30 grams for sugar. Scales are out of my price range right now. Thank you for posting such detailed tutorial on macarons. I’ve been using your recipe since my first trial (2 years ago) till now. However, after my first attempt, which is also my first successful batch, I hardly get them right after that. I’ve came across articles online regarding problems that occur on macarons, and tried to avoid them the best I can, but somehow the errors occurred one after another: the 2nd trial was too runny; the following trials had hollow shells, following by cracked shells, sticky shells, and sometimes they look successful but as I assembled them together, the whole thing collapsed ! But what I don’t understand is I’ve been using your recipe and the same methods every time. Recently, I’ve had a successful trial after nearly 20 times of failure, but on the following trial, all my macarons cracked right through the middle with the same pattern on each and every one of them. Is there any ways to prevent all these? It’s been very disheartening after all the failures but I really want to get them right. In the tutorial there’s a list with the most common problems and the reason why they appear, included cracked macarons. It sounds like the temperature of your oven is higher than should be. El caster sugar es el azúcar extrafino. 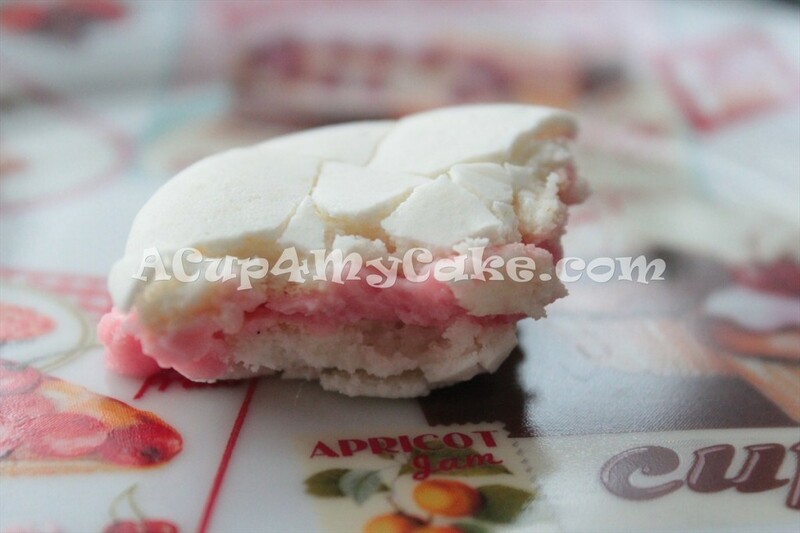 I tried efew time different recipe of macaroon but i dont succes. I want to do your recipe but i dont have kitchin scale. If you use measurement cups, the macarons won’t turn out well probably!! 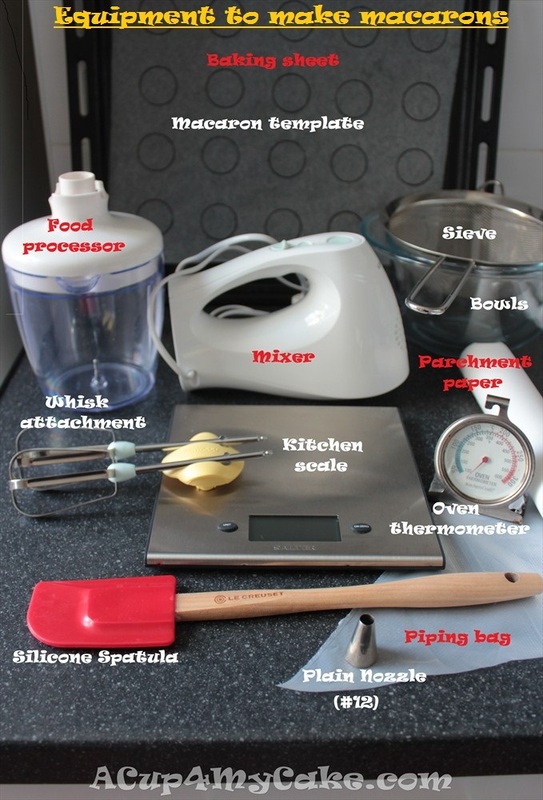 You need a kitchen scale to measure accurately all the ingredients. Macarons are very delicate! Anyway, if you want to give it a try, use google to find the equivalence. I don’t know any recipe in cups. Try not to over bake them or they will dry, being cookie-like. Regards. I love your tutorial!! I tried the recipe the first time today. I love the way my cookies (un filled) taste. I didn’t get true feet-they were very little, more like just the first two letters: f-e. I was okay with that for my first attempt. My batter was a little runny as I piped it onto my silicone mat. I’m afraid I didn’t fold the dry ingredients in correctly. I ended up with 11 2-inch cookies. That’s too few, I’m pretty sure. I removed my air bubbles and didn’t get cracks, I’m happy overall. I just would like to know how to improve upon my novice first attempt. Do I need to pee heat the oven before putting the marcarons to bake? How do your macarons stay so white. Mine always turn a golden colour in the oven. Hi Eda, bake them to a very low temperature (140C). If they still get brown, reduce your oven temperature to 130C. Also, don’t over bake them. Regards. Thank you for the precise instructions you give. I read all the comments and appreciate your willingness to help. My problem is that I often have hollow shells. I have tried to resolve the issue, but now I wonder if the problem might be my baking sheets. I use sheets with sides of about 1-1/2″. Are your baking sheets flat, or do they have sides? I have attempted macarons 10 times and failed all times! I’m ready to give up but macarons are so expensive it would be fantastic to know how to make it yourself! My macarons end up cracking all the time. Can I cook them at 200 degrees Fahrenheit? After 5 attempts i have finally mastered the foot of the macaron. However I’m really struggling with temperature and time. I have altered the temperature a few times and they wither come out hollow and undercooked. 150degrees c was too hot and they came out brown. Any help would be much appreciated. Hy Hayley, try 130 celsius for longer time. Regards, Sara. I’ve tried making macaroons three times. A possible 60+ failures T^T I get generally everything right and at the last stretch I always end up wanting to rage quit so hard!! So I know what temp and time to bake them at is ballpark 300-350 for 10-16 min. Simple, easy….BUT WHYYY!! Ohhh Rai, I’m sorry to hear about your struggle with macarons. The success depends on sooo many things… Specially your oven. Try to bake them even at a lower temperature, but for longer. Let us know if you get any better results. Regards.